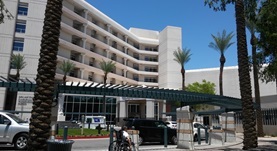 Dr. Andrew Duarte graduated the medical school from University of Arizona College of Medicine and did his internship at St Joseph's Hospital and Medical Center. He completed one fellowship at The John Hopkins University and two residency programs. Dr. Duarte is now specialized in Radiology and board certified in Vascular & Interventional Radiology. He has been practicing medicine for more than 6 years and is able to use imaging techniques in order to gather information about the human body. Furthermore, Dr. Duarte works at St. Joseph's Hospital and Medical Center.